This Saturday is a work party so please come down and and help get the club ready for the new season. Please sign in so that your hard work can be recorded. Hopefully Saturday will see the floating of the new race hut before it is transferred to the Island. This maybe anything from a great spectacle to a total embarrassment for the designer! To receive a £10 concession for renewal please renew before 1st April. March Level 1 Adult Course – crazy weather! 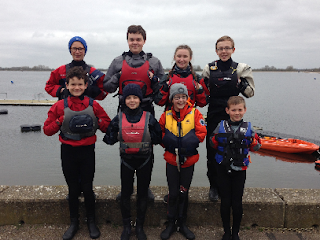 Faced with challenges of heavy weather weekend, five intrepid beginners nonetheless arrived on Friday to perfect learning conditions – 8mph with clear blue skies. Saturday was forecast to be less attractive so we set about a day of intensive sailing to cover the practical syllabus in one day. After a solid 6 hours sailing in an 8 hour day all students were tacking, gybing and sailing a rectangular course – unheard of so quickly! Saturday saw everyone out in 20mph winds, with some unpredictable guts. What stars! Capsize drills were perfected during the first few minutes, as were crash gybes and untangling buoy anchor chains from rudders. Theory in the afternoon left us with five excellent sailors, all keen to progress and join in club sailing. Star of the w/e had to be Gareth who insisted on going out on Saturday afternoon in white horses and heavy gusts. That certainly won the hero of the day award. All will be coming back for more at one of the spring level 2 courses. Why not join them? Due to high wind speeds Easter Monday's Race is abandoned. Please take care on the wooden jetty by the lakeside. Repairs are being carried out by a team of pressed men, sorry volunteers, Parts of it don't have any anti-slip mesh down and it might become slippery. This will be rectified soon. With a NE wind about 10 mph, Dave L used a Tektona start with a first beat to 5P, then 4P, 9S, 3P, 2P and back through the start. 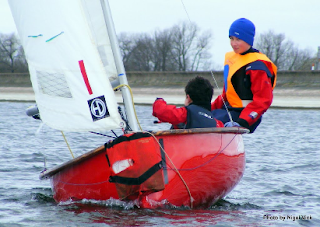 There were 17 starters and it was good to see Roland S back on the water after his recent illness. Sally (Byte) had started, but decided to retire somewhere on the first lap. At the gun Paul R took the victory with Chris H 2nd, Roland & Ryan 3rd, Ellen & Newton 4th, Jon 5th and Peter R 6th. Sally, Dave I, Mick G and Dean & Nick decided not to contest the second race, but Mike T (Laser) joined the fray, so there were 14 starters. Paul R continued his good form of the first race coming through in 1st at the end of the first lap. Newton & Ellen 2nd were some way back with David C 3rd, Jon 4th, Steve S 5th only just ahead of Ian C in 6th place. Adrian in 7th place was closely followed by Roland & Ryan. Then there was a gap back to Peter S, Chris H and Peter R who were having a good scrap and brining up the rear of the fleet were Mike A, Hadey and Mike T.
At the end of the second lap Paul still led, but David C had moved up to 2nd and Ian up to 3rd pushing Newon & Ellen down to 4th. Adrian and Roland & Ryan moved up a place at the expense of Jon. Further back Peter R had moved up two places to 9th and Mike T had managed to get past Hadey. Paul crossed the line in 1st place with Ian getting past David to take 2nd. Newton & Ellen were still 4th but Adrian and Roland & Ryan had passed Steve S to take 5th and 6th respectively. 1st Paul R; 2nd Ian C; 3rd David C; 4th Newton & Ellen; 5th Adrain; 6th Roland & Ryan. 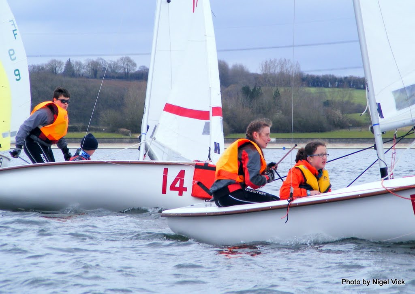 On Handicap there will be some slight shuffling of the pack with 1st Paul; 2nd David C; I 3rd Ian; 4th Newton & Ellen; 5th Chris H; 6th Steve S.
Thanks to Dave L and his OOD Team of Paul W, John H, Paul R and Simon R..
Two teams of Reading Sailors took part in the National Schools Sailing Association Team Racing Event on Saturday up in Oxford Farmoor reservoir. Team A consisted of William and Joe as helms, with Edward and Ben as their respective crews. Team B consisted of the older hands Hadey and Hugh as helms with Rhys and Katie as crews. The event was in Fireflies with 21 teams in total taking part, with teams from as far a part as Cumbria, Derbyshire and Worcestershire. 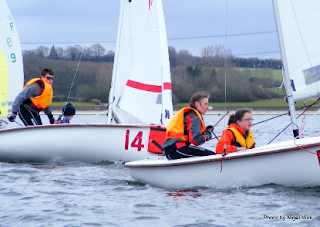 Weather was fairly dull and grey, although the sun did make one appearance, and the wind was a fresh 10-14 mph Northerly wind, so perfect for this type of racing – if a little cold. 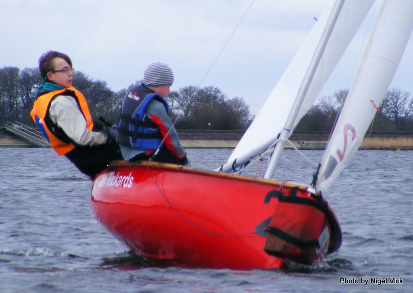 The competition was tough in this event, particularly for the younger members of the Reading squad with this being their first time in Fireflies and their first sailing event of the season. Team B started well winning 3 out of their first 4 races, with Hadey and Hugh displaying some good tactics and nabbing at least one race back from the brink, right at the line. However, as they progressed up the league they came into contact with increasingly better teams and their winning streak came to an end winning one out of their last 4 races to finish 13th overall. For Team A, it was tough going from the get go, and despite some tough challenges and close results they couldn’t manage to bag a race at the end of the day. They had some consolation, in that overall they managed to beat at least one team on points and so finished 20th out of 21. In the capsize stakes, Hugh, William and Joe all managed to sneak one in, with Hadey managing to avoid getting wet. A result that her crew Katie was pleased with. All in all everyone enjoyed themselves and team spirit and camaraderie was good. Below are a selection of photos. Jon (Laser) was first back through the start followed by Peter R in his Enterprise, Chris (Comet), Nev & Sally (Leader) and Newton & Scott(RS200). Steve S (Laser) came through in 6th place followed by a gaggle of closely bunched boats with Adrian (Rooster) 7th, Dave I (Radial) 8th, Mark B (Laser) 9th, Curtis (Laser) 10th and Mick G (Otter) 11th. Dave L (Laser) was slightly further back in 12th and then there was quite a gap back to Peter S (Byte),Alistair, Rick and John W in Lasers. By the second lap Newton & Scott had moved up three places to 2nd, but the next three boats had kept their relative positions. Steve S had moved past Nev & Sally into 5th place and Mark B had moved up two places to 7th. Dave L had moved up one place to 11th and John W was up to 12th. 1st Jon – Laser; 2nd Newton & Scott- RS200; 3rd Peter R- Enterprise; 4th Chris H- Comet; 5th Steve S- Laser; 6th Nev & Sally- Leader. What a great mix of boats in the top six ! Mick G decided to rest his Otter after the Pursuit, so there were 15 starters, but Curtis and Dave I disappeared on the first lap (reasons unknown). Newton & Scott led at the line but Adrian, Jon and Steve S were not far behind. Next came a group of Lasers with Rick in 5th just ahead of Dave L, Mark B and John W, although Peter S got the same time as John W. Chris H was next in 10th just ahead of Alistair S and Nev & Sally with Peter R strangely lagging behind after his sterling performance in the Pursuit. By the end of the second lap Adrian was King of the Roost, pushing Newton & Scott down to 2nd, but crossing the line with exactly the same time as Jon. Steve S was still 4th but Dave L had gained a place to 5th. John W was up two places to 6th with Mark B 7th and Rick 8th and Nev & Sally up three places to 9th. Peter R had gained three places to 10th. After three laps the first five had maintained their positions but Mark had moved up one place to 6th and Alistair S had moved up three places to 9th.Rick and Peter R had both retired, but again reasons unknown. The only change in position at the gun was that Peter S had moved up one place by passing Alistair. 1st Adrian; 2nd Newton & Scott; 3rd Jon; 4th Steve S; 5th Dave L ; 6th Mark B. On handicap the positions will change considerably with Adrian dropping to 4th and Chris and Peter S taking 5th and 6th from the Lasers of Dave and Mark. Thanks to Mike N and his OOD Team of Mike C, Bill C, Al E and Matt R for running the races. This week was not quite as windy as the previous few weeks with a light Westerly. John W set a course of 6P, 9S, 5P, 4P, 2P, 8P and back through the start. David C (Laser) was first back through the start followed by Ian (Supernova) then the Lasers of Mark B and James and these four maintained those positions for all five laps of the race. Nev & Sally (Leader) were going well in 5th place with Adrian (Vago),Dave L (Laser), Chris H (Comet) and Dave I (Radial) all close together and hot on their heels. Slightly further back came Dean, who had abandoned the Vago for his Laser and he was having a good tussle with Hadey(4.7) and Alistair and Steve P both in Lasers. Bringing up the rear of the fleet was the ever present William in his Topper. By the end of the second lap the only movers (in the right direction ! )were Dave L up two places to 5th, Dean up two places to 8th, Steve P up four places to 9th and Hadey up one place. The only mover on the third lap was Chris who gained two place to move up to 9th, but he was in the middle of a great battle between Nev & Sally, Adrian, Dean, Steve P and Hadey. At the end of the fourth lap the first seven boats crossed the line in the same order as the previous lap, but Steve P had moved up two places to 8th. William was given the finish gun at the end of this lap and Dean and Dave I decided four laps were enough for them. At the end of the last lap the first five had retained their positions, but Steve P had done it again moving up another two places to 6th pushing Nev & Sally down to 7th. The final positions on the water were – 1st David C; 2nd Ian C; 3rd Mark B; 4th James; 5th Dave L; 6th Steve P.
On handicap the first five positions should remain the same, but Chris H in his Comet should push Steve P out of 6th place. Thanks to John W and the OOD team of Mark & Deniske R, Nick J, Hugh and as ever Roland L.
This was the last of the Frostbite Series and means that despite missing the last race Newton & Ellen in their RS200 take the series honours. Congratulations to them and also many thanks for their contribution to the racing programme.